St Joseph's is a multicultural school. We have Chinese, Indian, Tongan, African, British, Irish, Australian, Latin American, Other European, American, and other Southeast Asian cultures at our school, as well as New Zealand Maori and Pakeha. 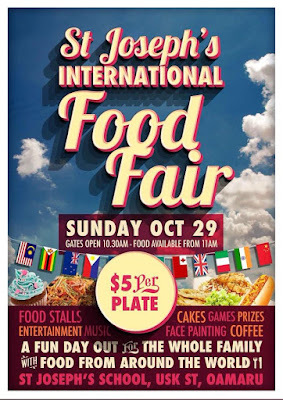 Our families love to share their culture and culinary delights and we welcome our school community and the general public to join us for our 3rd annual Food Fair. It starts after 9.30am mass, at 10.30am this Sunday 29th October and there will be a variety of foods and entertainment. It is a great opportunity for us all to get together and enjoy the talents and diversity of our community. Bring the children to have their faces painted, play on the bouncy castle and enter the cup cake competition. Thank you to Rebecca Heffernan and our St Joseph's Home and School committee for organising this event. Many thanks to Road Metals for providing the sand for our new senior sandpit and to Tim and Daniel Frances-Rees for providing the labour and the Home and School for providing the materials. All children who have started St Joseph's in the second half of 2018 are specially invited to join the parish for Sunday mass on Sunday 19th November. The Home and School will present each child with an illustrated Bible. This will be followed by refreshments in the Dean O'Reilly lounge. We encourage school families to join us for this celebration of our new students and their families. Check out our Facebook page for other news from the week and remember to take advantage of the amazing books on offer at Book Fair next week. The hall will be open for Book Fair before and after school each day. 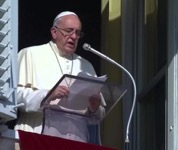 Pope Francis’s message for the 91st World Mission Day, "Mission at the Heart of the Christian Faith". Want to find out more about your Catholic faith. The New Zealand Catholic Bishops Conference (NZCBC) has some wonderful resources that will help you. Take a look at the NZCBC website. Our own Catholic Diocese of Christchurch site is one to bookmark too! The Scholastic Book Fair is on all next week in the school hall from 8.40 am to 9.10 am in the mornings and 2.45 to 3.15 pm in the afternoons. Eftpos facilities available. There is a basic First Aid course being offered to the children appropriate to their age level next week at school. Please bring a gold coin donation per child to help cover the costs. Our St Joseph's School Food Fair is on this Sunday with gates opening at 10.30 am and food available from 11.00 am to 1.00 pm. We would love for all of you including family and friends to join us on the day. If you have cakes, cupcakes or other items to drop off before Sunday, please take them to the school hall on Saturday between 4.00 - 5.00 pm or Sunday morning between 8.00 - 10.30 am. We still have more room for baking for the cake wheel and are grateful for any biscuits, loaves, muffins slices etc. On the day you buy food tickets for $5 each which gets you one plate of food. Eftpos facilities will be available on the day for cash withdrawals to a maximum of $30.00. You need cash for the drinks, face painting, ice cream and coffee trucks and the cake wheel which is $2.00 for 2 spins. 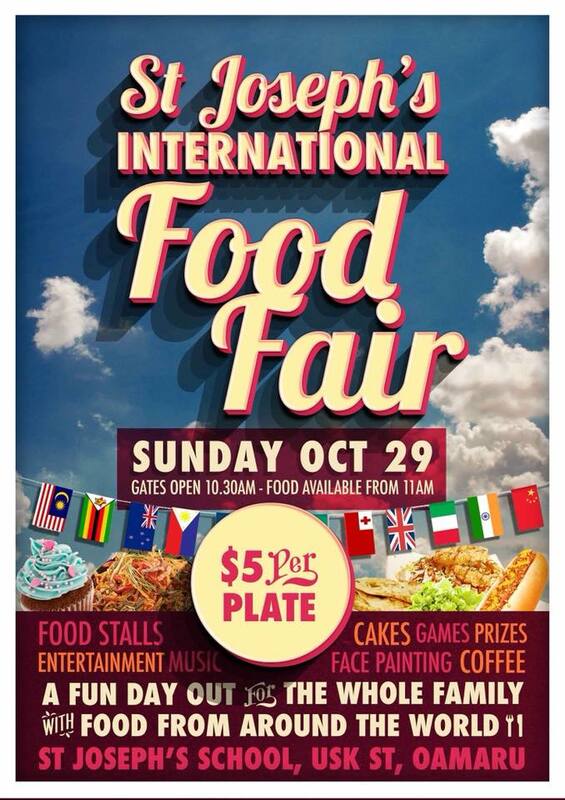 If it is raining, the Food Fair is still on and will be held on the verandas outside the classrooms. Will be held on Wednesday 1st November at 9.30 am at the Basilica and this will replace the Thursday Mass. Everyone is welcome to attend. - Afternoon - cultural items performed by St Joseph's pupils (parents are also welcome to present an item). We are asking for parents to come in and take an activity with a small group of children. You will have a teacher in the class with you. Having parents in to lead an activity has proved very popular with our children. We would like to provide activities from as many of the countries represented in our school as possible and having parents lead the activities provides a rich and varied range of skills and crafts for the children to learn. We will provide any materials you need. The activities need to be hands on and could include arts, crafts, music, dance and games. As the weather is getting warmer, we are not having the pies lunches anymore on a Wednesday so please ensure your child has a packed lunch. If you child brings a pie to be heated, you will be rung to bring a lunch. Reps - Congratulations to Troy Chikowore, Max Fatafehi, Jacob Robinson, Sebastian Spillane and Michael Woodhouse for making the North Otago Touch Rugby U12 rep team. They play in a tournament on Sunday 5th November which doubles as a Otago Touch Rugby trial. Good luck to them. Sessions - Grant Milne from Otago Touch Rugby came to school on Wednesday to take touch rugby sessions with our children from years 3-7 where he showed them through games how to change direction, dodge other players, pass the ball properly and communicate amongst their team mates. The following are provisional cricket teams for this year. There could be some changes in the teams as the coaches see more of the players. If your child is unable to play, please contact Mr Justin Fowler on jfowler@stkevins.school.nz or ph 027 426 5370. First game is this Saturday 28th October for all grades. Super Star teams play at Centennial Oval (Excelsior Rugby grounds). Meet there at 9.10 for registration with the session starting at 9.30 am. Cricket Uniform - the Intermediate A team is to wear all white because it is a mix of schools and the other teams to wear St Joseph's PE top and white cricket trousers if they have them otherwise their PE shorts. Trainings for Intermediate and Primary teams is 3.30 pm at the St Kevin’s College cricket nets on Redcastle Road. These trainings will be taken by a group of coaches led by Glynn Cameron. Super Star players are invited to training if they want to attend, otherwise they just play on Saturday mornings. Parents are required to help run the Super Star teams on Saturday mornings. All up this will take an hour on a Saturday morning including getting ready to start to play. If you have no experience, that is fine as there will be people at Centennial Oval to show what you need to do and to provide help to get you started. Let Mr Fowler know if you can help. · Intermediate grades use a hard cricket ball. · Players use a wooden bat and wear gloves, pads and helmet. · Games will be played at different grounds around Oamaru. · The St Joseph’s home ground is at St Kevin’s College. · Primary Grade teams use an incrediball (not as hard as a cricket ball). · Games will be at different grounds around Oamaru. · Super Star teams play at Centennial Oval (Excelsior Rugby grounds) from 9.30 am to 10.15 am on Saturday mornings. · Players use a plastic ball and bat. No pads or helmets required. · These players join together with kids from other clubs and they receive coaching from North Otago coaches and helpers. · From the Academy, they advance to playing in Super Star teams when they are ready. - A reminder there is no blanket cancellation of cricket. Visiting teams should contact the home team to see if conditions are suitable to play. - Sam Bastian and Francois Mostert will make the call on whether the Super Star grade and Super Star academy is cancelled due to the weather. Super Star Teams - players in these teams will participate in the Super Star Academy on Saturday. Please be at Centennial Oval at 9.10 am for registration. Super Star Academy - all children to be at Centennial Oval by 9.10 am for registration. 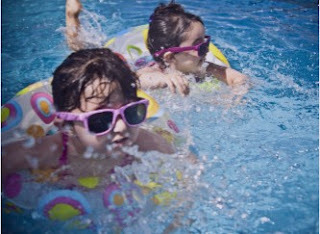 Hi Parents, Waitaki District Council want everyone in the community to have safe fun in the sun including staying safe around swimming pools. Preventing children from drowning is the reason why safety standards are in place and making sure correct barriers/fences are in place is one way of doing this. On 1 January 2017 a new set of rules were introduced to New Zealand. Specific responsibilities have been placed on pool owners and councils. We can all take very simple steps to make sure we minimise the risk to our children. As an example, if you have a paddling pool, please make sure you empty it after use. If you have a more permanent pool (spa, hot tub or a swimming pool which can hold 400mm or over of water), you must make sure it has an appropriate barrier to stop a child entering it unsupervised. For a limited time, Council is offering a free inspection of your pool. If you wish to take advantage of this offer please call us on 03 433 0300 or email us at building@waitaki.govt.nz. More information about these new rules and acceptable barriers is also available at www.waitaki.govt.nz . Thank you for your time and enjoy safe fun in the sun this summer. Fun Fit Kids Programme - for primary school kids being held at the Waitaki Recreation Centre on Fridays from 4.00 to 4.45 pm starting Friday 27th October. Costs $36 for 6 sessions. Register online now www.sporty.co.nz/waitakiwrc or phone 434 6932.